Great drawings over the centuries have often been overlooked as the art masters were recognised for their oil paintings. Imagine if you had access to a real artist who sent out different aspects of learning to create beautiful portraits. We have teamed up with an artist to create the “Monthly Portrait Tutorials”. We have taken onboard your feedback and teamed up with an artist to bring to you exactly what you have asked us for. 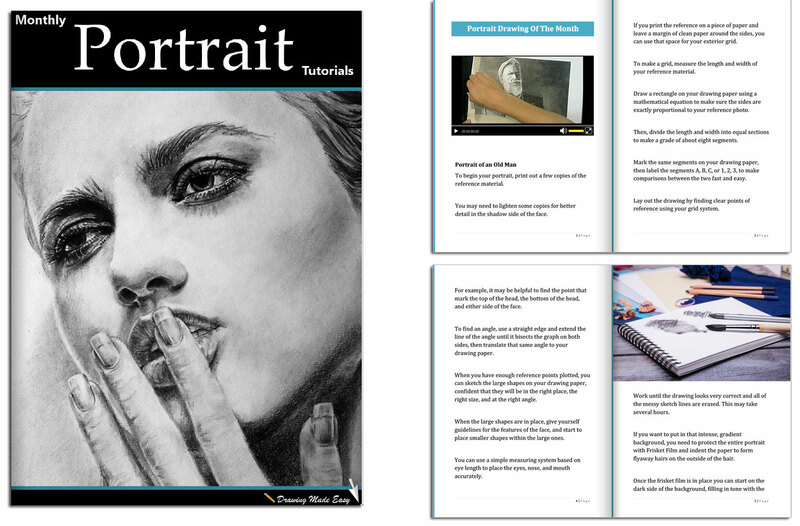 The magazine is generously illustrated showing you step-by-step how to create realistic looking portraits and a goldmine of sample illustrations for further ideas. Our artist will create a new portrait drawing that you can learn to create yourself by following along with the step by step instructions. Most people’s first question is what do I need to create my portraits. We have taken the guesswork out of this for you and give you a section dedicated to what you need and what is in trend at the moment. This will be an in-depth look at a portrait picture and the artist will dissect it and show you everything you need to create your own version or simply replicate. We cannot however provide refunds on past editions (i.e. if you have received 9 editions and request a refund on all 9, we cannot provide this). I thoroughly enjoy receiving your magazine in my inbox. I look forward to using several new techniques I’ve learned through watching your videos and it’s clear the artist has a lot of experience. I think anyone will find something useful in these magazines. It keeps you motivated to keep wanting to draw and perfect your skills even further. I especially enjoy reading in on my tablet. Keep up the great work! Just a few minutes from now you’ll be viewing your first edition and enjoying the material we’ve put together for you. If it’s not your first time learning how to draw portraits– I hope I can offer some new tips and tricks to add to your drawing arsenal!